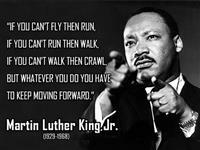 Jan 15 (Lagos) - Martin Luther King day is observed on the third Monday of January each year, which is around King's birthday, January 15. The holiday is similar to holidays set under the Uniform Monday Holiday Act in United States. All financial markets in USA will remain closed today to mark the day. The holiday is not celebrated in Nigeria where the markets opened and NSE rose 0.51% led by FCMB , SKYEBANK and CAVERTON . King was the chief spokesperson for nonviolent activism in the Civil Rights Movement, which successfully protested racial discrimination in federal and state law. The campaign for a federal holiday in King's honor began soon after his assassination in 1968. President Ronald Reagan signed the holiday into law in 1983, and it was first observed three years later. The sacrifices made by King are responsible for rights for people like us who are victims of slavery and apartheid.